My friend Dyanie and I planned an SG-Bali trip for our birthdays. We took Airphil's Manila-SG flight last May 26, 2011. Last May 28, we flew from SG to Bali via Airasia. Airasia's airbus was full of different nationalities. But Dyanie and I were the only Filipinos on board. We landed in Denpasar airport at almost 11:40pm. We lined up in the Xray machines for our luggage to be scanned. The moment the officer saw my passport - he carried my luggage. He asked me "is this yours?" I said yes. What could be wrong with my luggage.. The officer scanned our hands too. We don't have any idea what's that for so we asked him. He answered "secret". After he scanned our hands with that stick, he looked at me and said "come and follow me." He looked to Dyan and said "you also." omg. what's wrong? !So in front of all passengers of Airasia that night (na malalaki ang katawan, at yung iba may tattoo, at sila pa yung mukhang harmful kesa samin), kami pa ni Dyan ang mukhang may drugs! We followed the officer because we dont have a choice. We obeyed him, as if we already did something wrong. All other passengers were staring at us..
syet.. anong meron sa bag ko. at anong marks ang nakita nya sa kamay namin? kinabahan ako. this isnt just the usual immigration thing. this is something serious!We entered the holding room. There were 3 officers inside. 2 males and a lady officer. "Meet my Filipina friend. She was caught hiding packs of heroins in her luggage" said the officer. Sabay turo sa picture frames sa wall nila. It seemed like a gallery of drug traffickers from all over the world. 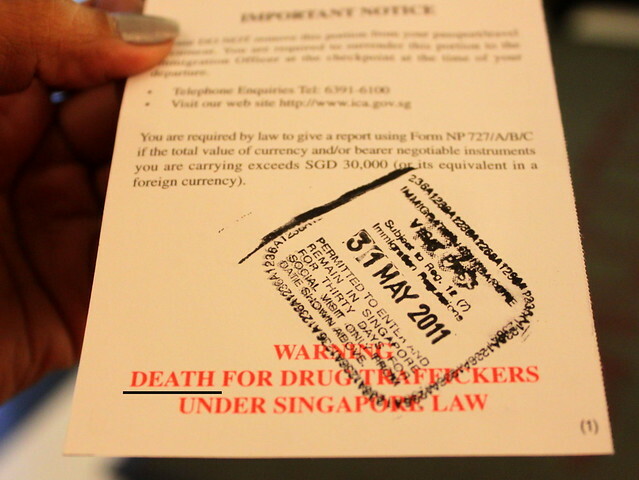 He reminded me that DEATH is the PENALTY of those drug traffickers. Paksyet. It's matter of life and death in the hands of these Indonesian Police Officers.. They offered something to drink but we refused. Yoko nga, baka dahil jan sa drinks na yan magkaron pa ng drugs substance sa katawan namin.."Do you know her?" asked the officer as he was pointing to the girl in the picture frame. - I answered no. nagpanting yung tenga ko. galit na galit ako. at the same time nalungkot. bakit ganun, tagged na ang pinoys as drug traffickers dahil sa kasalanan ng iilan.."Let's check your bag". The officer searched my things thoroughly. I was just looking at him. He checked every compartment of my luggage too. Ang lakas ng kaba ng dibdib ko. I knew he could frame me up. At wala na kong laban if that happens. Nasa teritoryo nila kami.Ansama sama ng loob ko. Dahil lang Pinoy kami, instant suspect na agad kami. After he messed with all my things and found nothing, I asked the officer what could be wrong and why was he checking us. He just answered "because the 2 of you are beautiful girls." putangina mo, nakikipag-cooperate kami sa inyo. naabala at napahiya na kami kanina pa. kaya sana sumagot ka ng maayos kung may tinatanong kami. For the 3rd time, we went outside the holding room to scan my luggage. I was really very nervous (and irritated). I could imagine him almost saying that he found something in my bag. Remember, he was holding my bag all the time. I never had the chance to touch it again..
you dont trust us. and we dont trust you either. the feeling is mutual. ang advantage lang, nasa Indonesia tayo. at kayo ang may authority. no offense pero meron ba silang extensive training na by just touching a body part malalaman na kung may drugs dun? ang hirap maniwala. they cant even speak straight english to start with. mayabang lang sila. pero wala silang masyadong alam.Now back in the holding room, and I was with the other 2 male officers. They started bragging that they captured all of the drug traffickers in the picture frame. Im still not sure what will happen next as they never told us anything. What now!? gusto nyo lang may mapatunayan kayo at may madagdag kayong picture jan sa wall nyo? !Im so proud of Dyan. She went back in the room and still didnt breakdown. I knew I will start crying too if I see her terrified. pero sa totoong buhay daw, sobrang takot na nya na masesetup kami. Dyan said I dont look scared at all too. I just look very irritated. After 1.5 hours, they finally let us go. Wala silang nakita. They thanked us for being cooperative pero di ko pinansin yung hand shake offer nila. Galit na galit ako. Pero alam ko bawal ako magsalita. Hindi rin sila nagsorry sa abala na ginawa nila. Para san pa, wala na kaming gana na pumasok ng Bali. Sirang sira yung bakasyon namin dahil sa ganitong pagwelcome nila sa Pinoy. Sabagay their sorry wont be enough. Kulang yan sa kahihiyan, sobrang takot, trauma, at paranoia na inabot namin dahil sa kanila. Ang sama sama ng loob ko. Putangina nyo! We met the hotel driver who's been waiting for us since 11:40PM. We finally went out of the airport at 1:30AM. I thanked the driver for waiting for us. He wasn't surprised that we were the last to go out. Sabi nya, kapag Pinoy chinecheck daw muna. Dahil lang may mga Pinoy na drug trafficker, lahat ng Pinoy drug traffickers na agad?! So it's also fair to call all Indonesian Policemen RAPISTS?! How about call all Policemen DRUG DEALERS because of this? Or can I tag all Indonesian ADDICTS sabagay 51 thousand locals nila ay junkies? 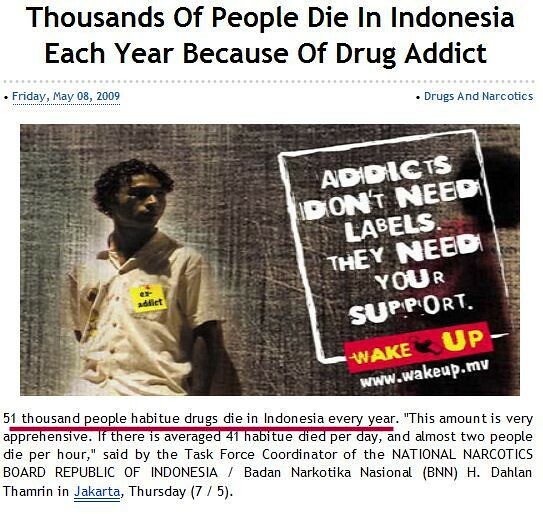 I hope if an Indonesian visits Pinas, ma-tag din sila as RAPISTS, DRUG DEALERS, and ADDICTS instantly! Maramdaman nila sana yung treatment nila samin.. Yan ang rules nila di ba? Wala pa kaming 2 oras sa Bali pero gustong gusto na namin umuwi ng Pinas. Sirang sira ang bakasyon namin. Putangina nyo! Naging praning na kami everytime may police kaming makikita. Or everytime dadaan kaming xray, paulit ulit muna naming pinapagpag ang bawat damit namin - oras oras - just to check na walang naisingit na drugs sa gamit namin. We're so traumatized that we wont be planning to go out of the country anytime soon. As I have mentioned earlier, I have re-posted her experience to share what happened to her. This might have already happened and currently happening to others. If anybody you know experienced the same thing, it's time to stand up and be heard. If you have the power to spread this information, please do not hesitate to re-post this. This is an opportunity to show what we can do something so that this experience will not happen to others. I will not wait for our government to impose travel sanction to Indonesia. I will never travel to Indonesia for leisure. Let us spread the word to boycott any vacation travel to Indonesia. I hope this way, they will know that we should not be intimidated by their actions to our fellow Filipinos.